The raw wound of unemployment still rests at the center of the global economy, as a result expanding its presence over the realm of cinema. 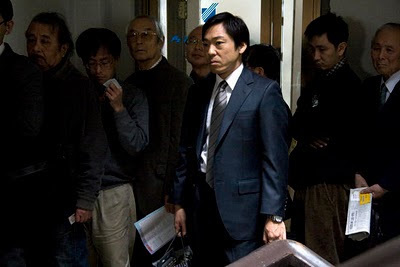 But before Jason Reitman coaxed audiences with his charmingly down-tempo Up in the Air, one of Japan's contemporary auteurs, Kiyoshi Kurosawa, brought us fraught power and bleak humor with Tokyo Sonata. It's the story of a man who's lost his job at a high-profile company and, instead of telling his family, attempts to string them along for as long as he can on his severance package, suiting up every day and either looking for work or eating free meals in unemployment lines. Watching how the Sasaki family deconstructs underneath the weight of their patriarch's lies, from his two sons' crushed ambitions to his wife's desperate need for stability, manifests into a poignant portrait of deceit's futility and the nature of true respect. Kiyoshi Kurosawa's subtle talent begins with a dash of imagery at the beginning of the film, showing a woman (Kyôko Koizumi) in a typical Japanese home cleaning up the mess made by a rain shower -- suggesting a "storm" is brewing, one that might spark her curiosity to look face-on into her conflicts. At first, it seems as if the majority of picture will zone in on the downsized father, Ryûhei (Teruyuki Kagawa), and how his lie-riddled attempt at maintaining his family's esteem creates his storm. Teruyuki Kagawa's talent suggests this with his piercing, downtrodden eyes and coarse vocal delivery. We watch him limply listen to a job placement officer suggest fast food management and security officer jobs, as well as witness how he reacts when he bumps into a high-school friend who's also an unemployed professional. Moments with his wife and two sons, one a middle-school boy who finds his way into trouble and the other a late-teens kid staying out late while "at-work", are conservatively incorporated early in the story. They seem minor, more like pieces moving around Ryûhei's plummet. Tokyo Sonata, contrary to its opening assumption, pivots into a versatile character study that explores each of the four members of the Sasaki family, showing how the father's "hidden" transgressions dictate the manner in which he controls his family -- and how they all develop around his change in behavior. For the most part, this concerns each of his sons and how he latches them down from their dreams. Each of them sees differing paths for themselves, the youngest as a piano player and the oldest as a solider, which goes against the father's desires for them to become secure, company men, like himself. These are just "whims" to Ryûhei and cannot possibly lead to a future like the one he's created, which, ironically, he's defending even though cheaper employment sent him spiraling into this vortex of lies and falsely-postured "respect". This respect is, obviously, important early on in the picture when the father takes a blow to his stature in the family, but it festers even more amid his hypocritical lies. The two-faced balance Ryûhei attempts to keep as he controls his sons -- refusing to allow his eldest to enlist in the military, declining to pay for the youngest to take piano lessons -- builds a situational complexity around the family in Tokyo Sonata that's really compelling. 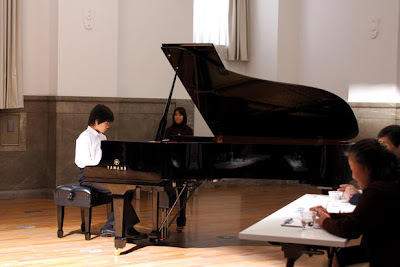 Our eyes are mostly drawn to Kai Inowaki as the musically-inclined youngster Kenji, who finds ways around his family's wishes for him not to learn how to play the piano. It's obvious that he's a decent kid from the beginning, yet he gets trapped in misbehavior in ways that we're able to see as a kid reaching and/or lashing out. He's not the type to bring in dirty manga (comic) books into the classroom or cause trouble with his teacher, yet he seems like a troublemaker in the eyes of those unaware. The same can be said for his older brother, Takashi (Yû Koyanagi), who stays out late at night while working hard and desires to serve a greater purpose by fighting in the Middle East wars. Both know their purpose, and both wish to pursue it. Kiyoshi Kurosawa keeps Tokyo Sonata astonishingly genuine through impeccable performances from all his actors, while also maintaining a tonal motif that encapsulates despondency in a very real fashion. He's a master of mood, yet his talent has mostly centered on crime horror pieces such as Cure and Pulse; the experience earned in those clearly shows in this burdened portrait of family collapse, as the stagnant and unnerving anxiety swimming about Ryûhei leaves the film with a haunted feeling. Much of that comes in the way that Kurosawa and Akiko Ashizawa keep a nervous focus on the vast number of shots in the film, retaining the fire in each character's eyes amid seemingly tame conversations. Tokyo Sonata goes for the throat and drapes depressing employment lines and the conversations in the Sasaki house with rousing harshness, yet also with faint glimmers of very dark humor. As much hope as we have that it'll all turn out well, we're reminded through various thematic splashes in Kiyoshi Kurosawa's film that Ryûhei's lies will lead to the family's collapse -- which it does, but in particularly poignant ways that offer glimmers of gasping hope. Each and every character can't escape the black hole of the father's dishonesty, and we can respect that facet of the picture; however, it's the way that they come into their own -- even the mother, who slowly reverts from her one-note, passive housewife persona into a key entity -- that breathes massive resonance into Tokyo Sonata. They all go through their own trials and troubles, their own need for escape, and we're left helplessly watching their almost phoenix-like crash-'n-rise from the ashes of what they previously saw their family to be. The stinging deceit and domestic contortion around its repercussions can be tough to watch at times, but the power in Kurosawa's filmmaking still makes it a brilliant film to behold -- all the way to the film's last, undeniably beautiful shots of a boy realizing his aspiration.